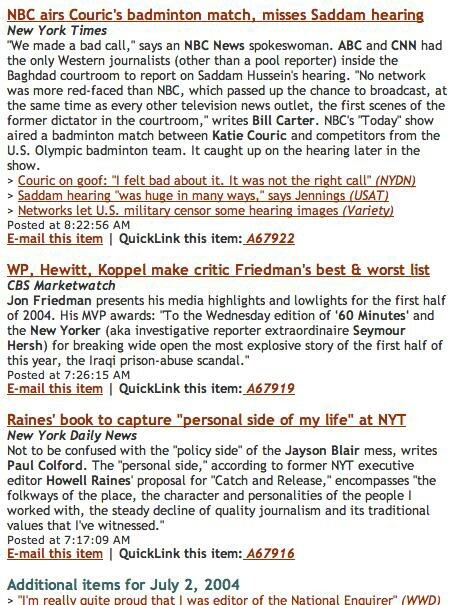 The Intolerable Evolution of Poynter's "Romenesko+"
The “Romenesko” blog (launched in 1999!) was a one-man shop, under the corporate parentage of the Poynter Institute, until fairly recently. It was quite successfully run by its founder, Jim Romenesko, though you could tell every once in a while he’d go through periods of advanced boredom in covering media day-in and day-out. 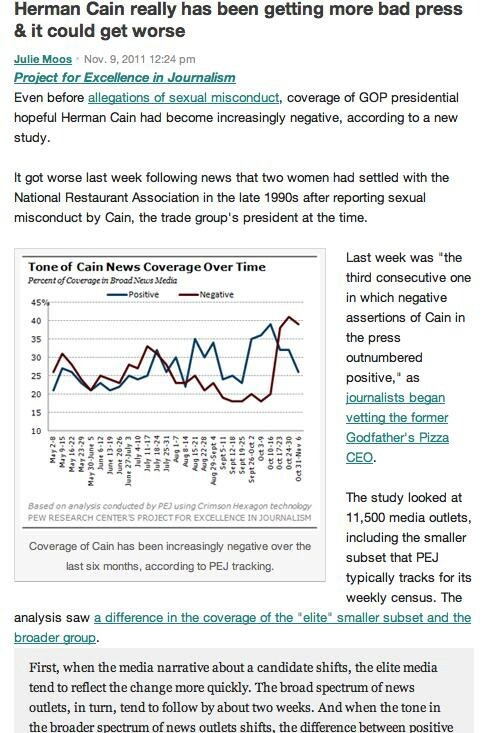 People (well, reporters and editors) mostly loved it; the headlines were, unusually, out-bound links. So it sent traffic. Romenesko’s slight summaries were careful and sometimes sly. The “technology” of the site as such was pretty laughable, down to the ridiculous URL. He was super-fast, he was fair and he was, very subtly, often dryly funny. Then Poynter got whorey. The headlines became permalinks to the site itself, so it stopped sending much traffic. The site became more “social” in orientation. The posts got longer. More Poynter-as-newspaper-sherpa crap crept in (“How will you handle graphic images or video of Gadhafi’s death?” Zzzz). Two years ago, Julie Moos, who’s been with Poynter for ten years, got her latest promotion and is now the big boss of publishing at Poynter. I have no idea what she’s like, possibly wonderful, but as a blogger and writer, she’s ham-fisted, at best, to my ear. The changes at the blog have been awful to watch. Let’s take a look at the new way things are done at Poynter’s blog — semi-rebranded as “Romenesko+,” which, let’s just pretend that didn’t happen. This is what it used to be like. Romenesko’s entire practice was about giving credit, in ways that virtually no other blog has been, a position that “Romenesko+” does not embrace as strongly. Poynter has worked systematically to erode a fairly noble, not particularly money-making thing as it works to boost “engagement” and whatever other (highly transitional!) web “best practices” are being touted at the heinous “online journalism” conferences that regularly go on. 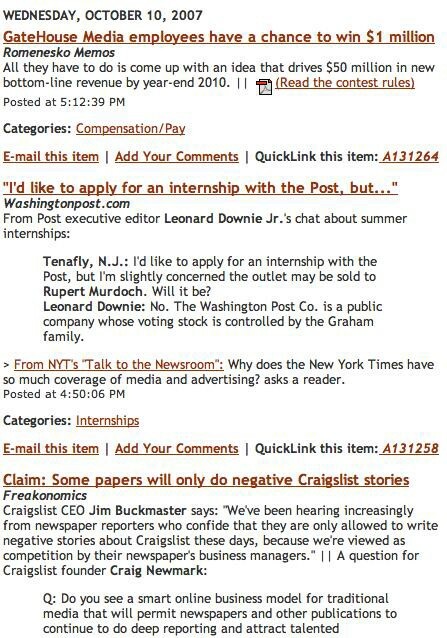 Charitable with links and naming bylines, and producing even more links when grubby reporters would come emailing with “but I posted that memo just now tooooo!”, the intention underlying Romenesko’s work has always been directing readers to reported material. To be fair to Moos, though I don’t particularly care, in her position I don’t think she has any choice but to publish about this. It’s the sort of media “process” stuff that is Poynter’s bread and butter (along with initiatives like “Writing Better Headlines and SEO Essentials,” an online class you can take in February!). Moos is also too coy. 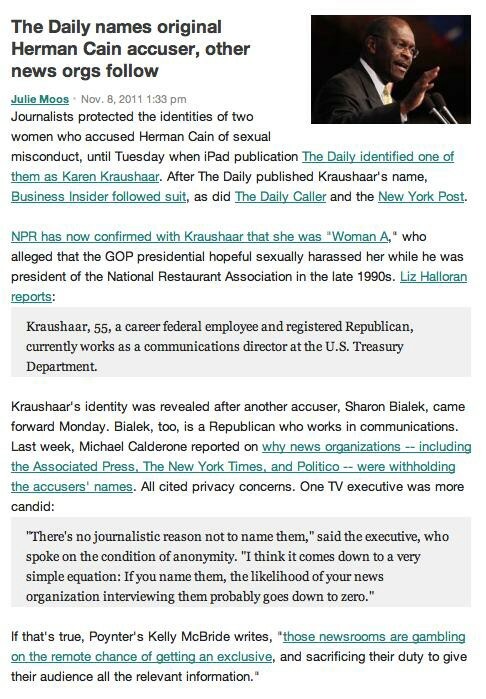 She learned of all this “thanks to the sharp eye of Erika Fry, an assistant editor at the Columbia Journalism Review.” What she meant was that Fry is working on a story about Romenesko and attribution, and so Moos went to publish first. I found that attribution a little incomplete.